Animation Xpress for 24 July reports that the four The Jungle Gang films are out, starring Bo, the bar-headed goose; Kuttu, the Slender Loris; and Bhoora, the blackbuck. 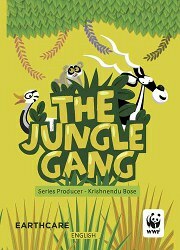 The Jungle Gang is the first Indian wildlife film series that has been made exclusively for children and young adults. The series has been created by Earthcare Films of Krishnendu Bose and financially supported by WWF-India.